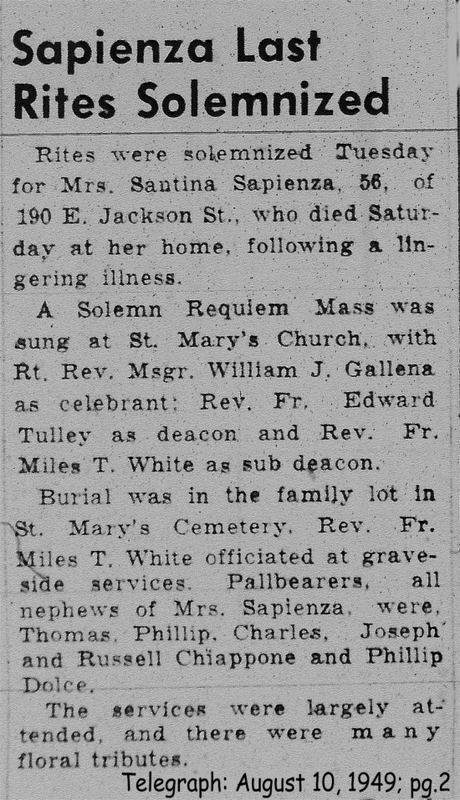 Santina Dolce first appears in at Painesville, Lake County, Ohio, in April, 1913, at age 20. Santina arrived with her brother, Calogero Dolce, and sister, Francesca Dolce. In America, Santina Dolce was known by her married name, Santina Sapienza. Santina Dolce, daughter of Filippo Dolce and Rosalina Nasca, was born on Friday, February 10, 1893, at Montemaggiore Belsito, Sicily. 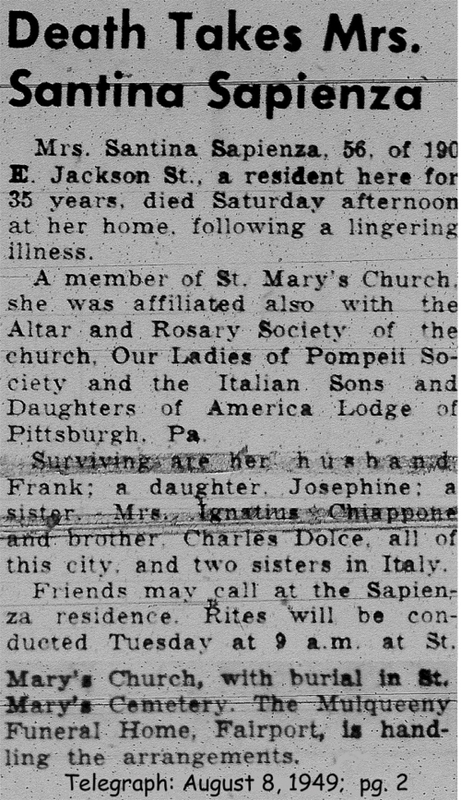 Santina married Francesco Sapienza, son of Giovanni Sapienza and Rosa Nasca, on January 9, 1916, at Cuyahoga County, Ohio. She died on August 6, 1949, at 190 East Jackson Street, Painesville, Lake County, Ohio, at age 56, of hypertension. Her body was interred at St. Mary Cemetery at Painesville Township, Lake County, Ohio. 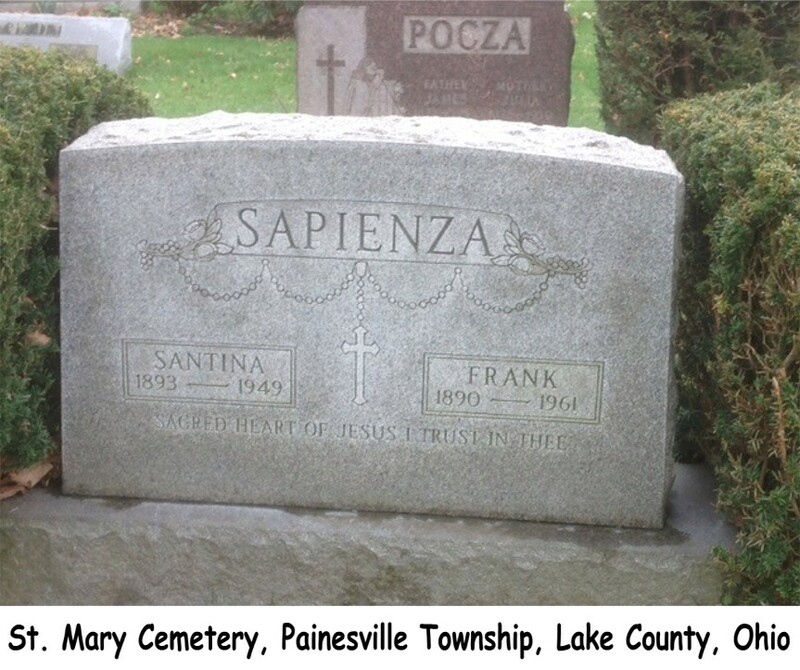 Santina Dolce immigrated to the United States on Saturday, April 5, 1913, at age 20, travelling to Painesville, Ohio., She was joining her cousin, Calogero Pace, in Painesville. Santina was accompanied by her brother, Calogero Dolce, and her sister, Francesca Dolce. Mrs. Sapienza became a citizen of the United States in 1944. Santina resided at 31 Prospect Street, Painesville, Lake County, Ohio, when she was naturalized.